The FSCAN is a high resolution clinical measurement and research tool for assessing existing and potential foot problems. It captures force and time data of the feet while standing or walking in shoes (with or without custom made orthotics or other insoles). A thin pliable force sensor is positioned between the foot and the sole (or othotic) within the shoe. As one walks the data is collected. 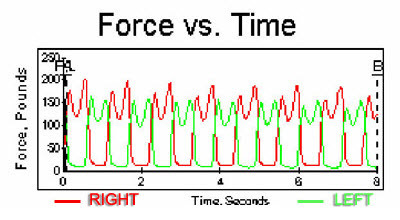 Proprietory (Tekscan Corporation) software is used to analyze the data collected, and is displayed as a series of pressure profiles, graphs and gait curves. From this information various parameters of biomechanical foot function can be seen. For example, is one functioning with a leg length discreptance, is there a failure of great toe to adequately extend during toeoff, etc?? The information supplements and correlates our clinical findings. It is not a replacement for clinical examination. The data is invaluable in determining gait abnormalities, normally undetected in clinical exam. Subtle leg length differences can have many reprocussions; knee, thigh and low back pain can occur. In these modern times, it's common to replace severely worn and damaged hips and knees. Leg length differences are obviously a common untoward complication. With the FSCAN the leg length difference (LLD) can be detected. A treatment can be devised and then the patient can be retested to determine the sucess or improvement , or even failure of the treatment. In addition, the FSCAN allows for quantitative assessment and documentation of the influence of an orthotic and or predicts the effect orthotic control may have on gait. Regions of unusually high pressure or impulse can be identified, which is especially important in the vascular compromised individual (such as PAD, diabetes, neuropathic ulcers). Interesting example of FSCAN application can be found on the Tekscan site. This invaluable tool has greatly assisted our practitioners, enhanced their diagnostic abilities, and understanding of structural and functional instabilities. It is also utilized in enhancing athlete training and the fine tuning of existing custom orthotic devices. At present these services are available only at our Toronto and Durham offices, however referrals for evaluation can be arranged through any of our locations.